Aviation Updates Philippines - National flag carrier, Philippine Airlines has launched five new routes from its hub at the Mactan-Cebu International Airport. Four domestic routes were launched on December 1, while one international route was sent off on December 2. EXPANDED AIR ROUTES. New routes from Cebu include Cebu-Siargao, Cebu-Camiguin, Cebu-Ozamiz, Cebu-Legaspi, and Cebu-Bangkok flights. Photo by Dirk Salcedo PPSG/AUP. Following plans to increase its domestic presence in the Philippines, the airline has recently expanded its hubs in Visayas and Mindanao. PAL Express launched flights from Davao to Cagayan de Oro, Tagbilaran, and Zamboanga in November. On December 1, PAL Express inaugurated its flights from Cebu to Siargao, Camiguin, Ozamiz, and Legaspi with its 86-seat Bombardier Dash 8 Q400NextGen aircraft. All of the routes are in direct competition with Cebu Pacific's regional wing, Cebgo. The following day, Philippine Airlines sent off its three-times-weekly Cebu-Bangkok service utilizing its 199-seat Airbus A321-200 aircraft. This flight service departs every Tuesdays, Thursdays, and Saturdays. "With economic development and tourism growth, the airline wants to capture travel business between Thailand and the Philippines by adding routes through Bangkok and Cebu, which is the second-largest city in the Philippines," Erwin Balane, head of route development of the Department of Tourism, said. From Cebu, the flag carrier already operates domestic flights to and from Bacolod, Busuanga, Butuan, Cagayan, Caticlan, Davao, General Santos, Iloilo, Kalibo, Puerto Princesa, Siargao, Tacloban and Tagbilaran. International flights from its primary hub in Cebu include Bangkok–Suvarnabhumi, Beijing–Capital, Chengdu, Nagoya–Centrair, Osaka–Kansai, Seoul–Incheon, Singapore, and Tokyo–Narita. Aside from Cebu, the national flag carrier is also expanding its operations in Clark, the only viable alternative to the worsening air traffic conditions at the Ninoy Aquino International Airport in Manila. 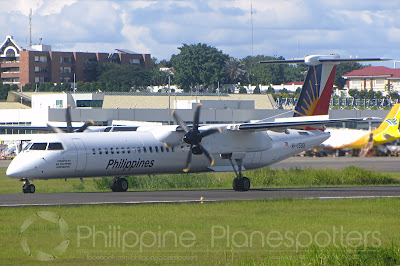 Thus, PAL Express, on December 1, launched its Clark-Masbate, Clark-Catarman, and Clark-Calbayog regional flights also utilizing its Q400NextGen aircraft. Tagbilaran, Virac, and Naga will also be connected to Clark on December 15, December 18, and January 16, 2018, respectively.